Tonight was one of the best nights in recent memory: got to see John Mellencamp (formerly John Cougar Mellencamp) — one of my all-time favorite singers — live in concert. My friend from work had free tickets — and our seats were center stage, about 20 rows back. Man, that guy can sing. And all kinds of music — not just Small Town, Jack and Diane, I Need a Lover, Crumblin’ Down, R.O.C.K. in the USA and Hurt So Good (which he really disappointed me by not singing, since it’s probably my third favorite song ever)… but he belted out jazz, hard rock, ballads and a little bit of everything. Haven’t seen an audience that wound up on a “school night” for a long time (and haven’t been that wound up myself in a while…). Everyone was sweaty and smiling when we left — a sure sign of a good time. 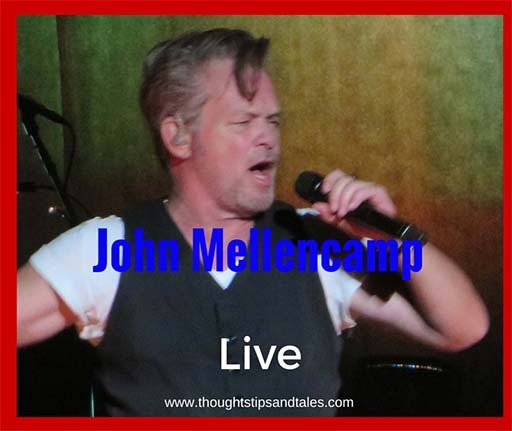 This entry was posted in John Mellencamp and tagged John Mellencamp. Bookmark the permalink. That’s awesome that you saw him live! I bet that was an amazing show. So fun.